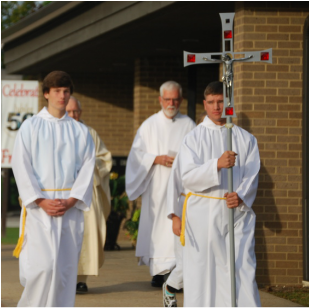 "I will go to the altar of God, the God who gives me joy"
Students in grades 5, 6, 7 or 8 who are interested in Altar Server Ministry are invited to attend one of our next training sessions. The sessions will be held on Thursday, October 4th from 2:30-4:00pm or Monday, October 8th from 4:00-5:30pm in the Church with Fr. Jeremy and Miss Dowd. If interested, you can choose one of these dates to attend. This is a wonderful ministry in which our young people give of themselves to assist the priest and to help people worship better. Please register by Tuesday, October 2nd. If you have any questions, please contact: Miss Maureen Dowd at the Parish Office or at mdowd@st-gabriel.org. This is a wonderful ministry in which our young people give of themselves to assist the priest and to help people worship better. If you have and questions please contact Miss Maureen Dowd at the parish office or at mdowd@st-gabriel.org.